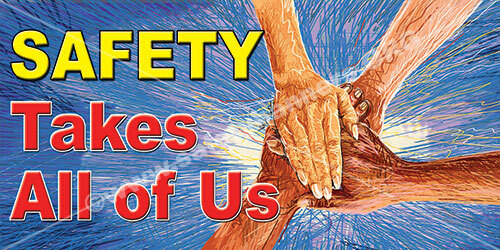 Safety banners for industry inspire a safe working environment and successfully communicate safety in the workplace. Communicate eye-catching slogans, graphics, safe practices, and procedures on large banners. Support your safety message throughout your facility with motivational and informative messagees to keep your employees engaged. Place posters in key locations, such as the breakroom and time clock to provide a daily visual reminder to practice safety. Industrial facilities have their own unique set of dangers, such as an employees lack of knowledge about the dangers. It is important to keep employees up to date with industry standards. Having safety messages front and center, will assist in keeping workers aware of their dangerous surroundings. The benefits of a workplace safety program can directly affect the company’s bottom line, reducing costs and improving productivity. Every workplace has hazards that endanger workers, but many of these issues are avoidable with the proper safety protocals, safety gear, and training. Safety Matters to all industries - it affects employees health, employers profits, the public's health costs and the global economy. Employers who invest in the safety of their employees see improved morale, increased productivity, lower costs and, most importantly, fewer injuries. Smart distributors understand their customer's unique, industry-specific needs then customize solutions such as product assortment and product education to meet the ever-changing demands. Just as workers’ performance should be evaluated, safety programs must be regularly assessed and updated. 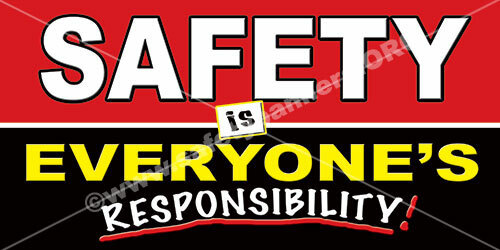 Allow SafetyBanners.org to assist you in keeping your safety message front and center with multiple sizes and products to choose from.